Some locations where you need to search for information about your ancestors may be beyond your reach. Over a period of 30 years I've often combined family research with vacation travel and with business travel - stopping at a library, a courthouse, or a cemetery along the way. But it has not always been possible or practical to get to some of the places that I wanted to research - especially those in England, Scotland, Ireland, and Germany. Yet I have been through many records from those places - without leaving East Tennessee. I've done this by ordering microfilms of those records through the LDS Family History Centers - and studying the films on their microfilm readers. Whether or not you accept or understand the religious beliefs of the Church of Jesus Christ of the Latter Day Saints (usually referred to as Mormons or simply as LDS) you can easily make use of their large collection of microfilms of records from all over the world. In addition to filming original source records, LDS also collects and makes available family research done by individuals and submitted to them. Some of the latter is on-line through a web site at www.familysearch.org The general caveat to only accept as being accurate those records that you personally verify from original source documents applies to all of these submitted records. They are only as good as the quality of the research done to create them. One exception is extractions of records done by LDS - such as marriage records. Those are usually done carefully by people at LDS Family History Centers in a controlled manner - extracted independently from the original source documents by two different people and then checked by a third person before being entered into the database. But, if you are doing a search at familysearch.org, you will have to check carefully to be able to tell the difference between extracted and submitted data. The microfilms of original source data, on the other hand, are images of the same information that you would find in records at a courthouse or other records repository. The extensive (maybe vast is a more appropriate adjective) LDS collection of church and civil records from all over the world is unique. There is nowhere else where all of this information can be found in one place. It can be somewhat daunting to even navigate the index for this microfilm collection to find what you need. Volunteers at the LDS Family History Centers will help you get started - if you have a pretty good idea what you are looking for. They won't do your research for you - but they'll point you in the right direction. These original records, of course, are in the original language and terminology of the locality - so they may take some time to decipher and translate. And often they are simply in chronological order with no index. I've spent many hours poring through old (1500s - 1800s) German church records in various forms of old German script handwriting. Then, as now, individuals' handwriting varied in quality and readability. But it is possible, with patience, to extract a wealth of information from these records. 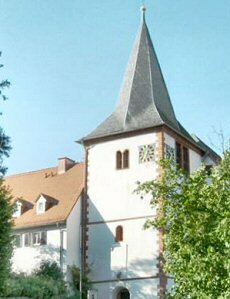 The photos above are of the Hoechst, Odenwald Evangelical Church and the Brensbach Evangelical Church in Hesse-Darmstadt, Germany. The records of births, marriages, and deaths from these churches have been preserved for several centuries - and are available on microfilm through LDS Family History Centers. 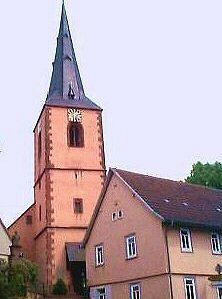 The ancestry of Johann Conrad Schnellbacher for several generations in the 1500s and 1600s is preserved at the Brensbach church. He was a saddle maker who moved a few kilometers to Hoechst in about 1680 - where additional records regarding him, his family, and his descendants are preserved at the church in Hoechst. His greatgrandson, Johann Peter Schnellbacher, also a saddle maker, and his family left Hoechst in 1840 for the United States - ultimately ending up in Madison County, Iowa. The latter was one of my gr.gr.gr.grandfathers. Once you have located places where your ancestors lived in other countries, you may also be able to obtain additional information through record repositories in those places. For England, Scotland, and Ireland, the existing old church records have been collected and indexed in a series called the "Old Parochial Registry" often referred to as OPR. The OPR is one of the sources that can be found through an LDS Family History Center or even searched on-line through some subscription services. I have used the OPR, for instance, in finding the baptism record for a gr.gr.grandfather, Robert Nicol, in Traquair in Scotland - and then for finding the marriage records of his parents and other records of some of his ancestors for another three generations. Another set of my gr.gr.grandparents, George and Elizabeth (Churches) Watts, originated in Somersetshire in England. After digging out the birth, marriage, and death records for several generations of this family through microfilms of church records from the locality where they lived, I decided to see what additional information might be available through the county records in Taunton, England. In this case, the custodian of the Somerset records was very helpful when I wrote to him. Since I had sent him a copy of all the data that I had found it was relatively easy for him to find additional vital statistics for other family members there. And then he volunteered the information that the records repository there also included the tax office copies of the wills of two of my gr.gr.gr.grandfathers - and told me how to order copies of them. These wills provided a unique glimpse into how these families lived, and the land, livestock, and other property that they owned. Usually the first challenge in searching for records in another country is in determining exactly where your ancestors originated. Just knowing that they came from Germany, France, Ireland, etc., is not enough. Somehow you need to find a more precise location - otherwise you will be searching for a needle in a haystack. Old letters and records that your ancestor kept that mention specific localities are the best source - if you can find them. This often requires getting acquainted or re-acquainted with near and distant relatives - since such items tend to become scattered or lost over a few generations. where one of my gr.gr.grandfathers was born. Sometimes specific origins were included in obituaries - if you can find them. For instance, in the examples that I cited above, the locality of the Parish of Meare in Somersetshire England was included in an 1894 obituary. The reference to the Parish of Traquair, which was in Peeblesshire Scotland was found (after a search over a period of about 10 years) on a page from a family Bible from the 1850s that I found while searching through a collection of photos and other papers that belonged to one of my second cousins. The Bible record had been recorded by my gr.gr.grandmother. And the town of Hoechst in Odenwald, Hesse, Germany was deduced from an 1886 obituary of a gr.gr.grandfather that simply said that he had been born in "Hagst", Germany. And an obituary of another gr.grandfather stated that he was born in Steinheim, Germany. In that case, that was just the beginning point - since there are numerous places in Germany with the name Steinheim. Every search is different. You have to start with what you can find locally or in family records and then be persistent in working back to more distant sources.